2019 is going to be a big year for me. I’m reaching new levels in my business. I plan to expand to do commercial work and rebrand myself. I will be working on a brand new web site and yes, I will still be doing weddings. I want to give my clients an A+ experience when they work with me. I have done so many weddings every year and I have a lot of footage to edit. I strive to produce the best quality and customer care for my clients. I want to be available for the people who really want to work with me and like my style. Search me on the knot and take a look at my reviews left by my amazing couples that I got to work with 🙂 Or just click HERE. I’ll leave you with one of the latest weddings I just completed! I tell couples that I look for ways to make the wedding film ‘theirs’. I feel like 2018 will be better than last year’s films because I am continuing to improve and I never am at a place where I feel like I have ‘arrived’. I strive to always do better. I loved filming this wedding because I got to capture such a beautiful first look and working with these two was amazing. The guys even wanted to have some fun so I threw in a small special effect with the groom punching the ground creating a shockwave throwing his groomsmen backwards. This is why you get a videographer! Alicia’s family gave my wedding videography service to her as a surprise wedding gift. What a gift! It was a fabulous day. All the money you spend on a wedding and to not have it filmed seems ridiculous to me. Your wedding is the only time in your life all your family and friends are in one location together to support you! Your wedding video allows you to relive that day again. It will mean more down the road when you can show your kids one day or look back to see your loved ones or friends. It was an honor to be apart of their day! I had the honor to film Allison’s wedding in July. I got to meet her because I filmed her brother’s wedding in 2015. It was a cool wedding to be apart of. I even got to film some fireworks with the drone. Enjoy! I loved filming Andrew & Katie’s wedding. I feel like this wedding shows you most of Cleveland. They even had their cocktail hour in the Cleveland Aquarium. This video shows the fun loving couple that they are! I had a great year! I filmed a little over 30 weddings. 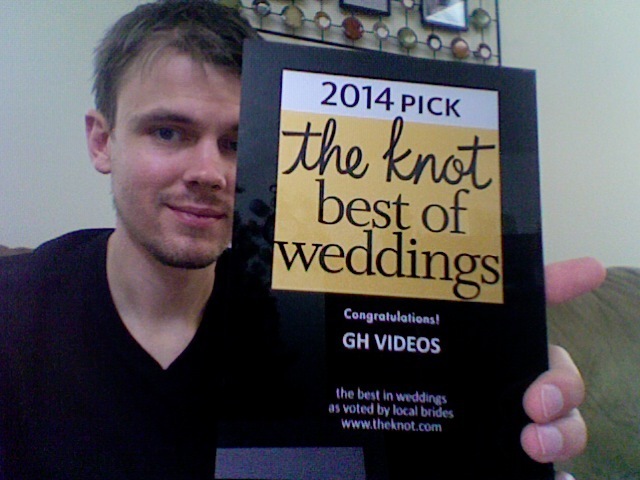 I received an award from the Knot for Best of Weddings 2014 Pick! I am trying to improve this year! I still have dates available. Last year (2012) I purchased a photobooth to add to my business. Photobooths are becoming a major hit at weddings. This booth is NOT someone snapping a picture.. it’s a do it yourself booth with an attendant. It includes a touch screen monitor (you can see yourself the whole time as a countdown lets you know when a picture is about to be taken), props (crazy hats, glasses, feather boas), a crystal clear 18mp camera, store photo print quality (these are not cheap ink jet printers which can feel wet after they print), and custom options (color or black & white and other options). Check out the photobooth page for more info. Why pay for a videographer?